The TARA GreenCast package for roofing uses state-of-the-art design principles to manufacture reinforced shells, commonly called channels. They are produced on specially designed TARA vibrating tables and profiled moulds. The production system is uniquely tailored to provide special end details, consistent shape and thickness; all crucial for high performance. The channels made with an optimised proportion of cement, sand and water, have a very high density, are impervious to penetration of water and provide high structural strength. Ferrocement roofing technology offers a viable alternative to conventional flat roofing systems such as reinforced cement concrete, reinforced brick cement, sand stone, etc. in both rural and urban areas of the country. Compared to RCC roofing, the ferrocement roofing channels offer savings in steel (30%) and cement (35%). The TARA GreenCast Channels and the associated equipment was developed with the support of Building Materials Technology Promotion Council, Government of India. The ferrocement are produced on specially designed TARA vibrating tables, fitted with electric vibrators of 2hp rating available in standard lengths of 3.05 metres, 4.6 metres and 6.1 metres with profiled moulds of equipment length. The profile of the mould varies for shorter lengths. For demoulding of the product from the casting mould, a lifting frame with lifting tongs is provided. Optional extras include movement trolleys and concrete mixers. 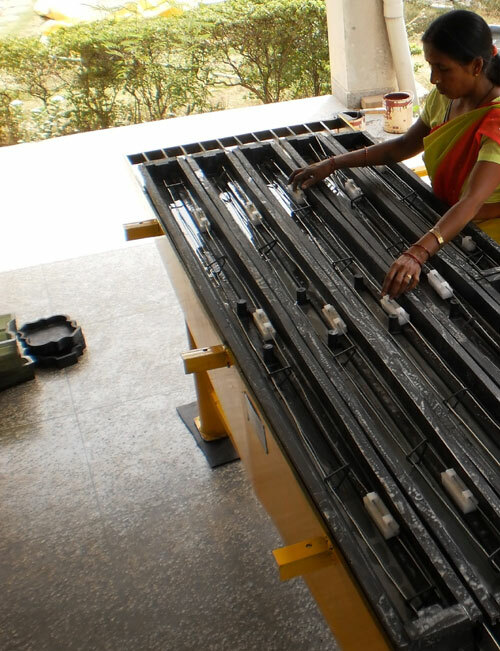 TARA lifting frames	 Lifting frames for balanced handling of mould after casting, as well as demoulding. These are available in 3.05m, 4.6m, 6.1m length. Enables 25% saving in cost when compared to RCC Flat roof. Ideal for use in construction projects where crushed stone is not available or costs are high. Additional savings due to no requirement of roof plaster.